How many ways can Idaho lawmakers tell the feds to get lost? Currently, one North Idaho state representative is asking the Environmental Protection Agency to get out of the Silver Valley within five years. Another lawmaker wants to buck the Federal Reserve System by declaring gold and silver coins as legal currency. And a third legislator is asking Congress to abolish the No Child Left Behind Act, while Idaho’s education department is crafting a waiver to get the state out of the program until it’s renewed. Bill by bill, lawmakers in Republican-dominated Idaho are declaring their independence from Washington, D.C. Democrats decry the moves as political posturing in an election year. Republicans, however, are hopping mad at a federal government that they say is meddling in the state’s affairs. And since about 80 percent of Idaho’s legislators are GOP members, they get to be right. If House Bill 430 passes, the people of Idaho could trade their greenbacks for ingots. State Rep. Phil Hart, R-Athol, has proposed a measure that would allow people to trade in gold and silver coins. Hart did not respond to calls and emails for comment. But Ray Batina, a professor of economics at Washington State University, says the bill may be redundant. There’s already nothing stopping merchants from trading jason crosby illustration in gold and silver coins. The problem is the market. “The only way a merchant would accept that as money is if they would turn around and use it as money,” Batina says. Idaho is already trying to get the federal health care law thrown out, having joined 25 other states to get the courts to overturn the early Obama-administration victory. Republican Gov. Butch Otter last year signed an executive order prohibiting state agencies from implementing the national health insurance overhaul. But Otter also had the state apply for a grant to set up health insurance exchanges mandated by the overhaul, because he believes it would be worse to have the federal government come in and impose an exchange, which they could legally do if Idaho doesn’t set one up by 2013. On the other hand, if the U.S. Supreme Court rules against the overhaul this June, it all could be moot. That’s left Idaho lawmakers in a pickle: Do they go forward with an exchange, despite an impending Supreme Court ruling? Do they wait it out in hopes that the justices overturn the health care overhaul? “Nobody has been willing to come forward and say, ‘We’re going to build some exchange that meets the federal requirements,’” says state Rep. Janice McGeachin, R-Idaho Falls, who chairs the Health and Welfare committee. Meanwhile, Democrats, like House Minority Leader John Rusche, from Lewiston, say the Legislature is blowing it by taking so long to set up an exchange. Last month, Otter told reporters that it may already be too late to set up an exchange, according to Boise Weekly. But Jon Hanian, Otter’s spokesman, says the governor is working with lawmakers to get some kind of bill introduced during the session. Bateman has proposed House Joint Memorial 8, which would call on Congress to simply repeal the act. Linden knows the nonbinding memorial is toothless. Still, his position puts him at odds with the state’s education department, which wants to see the act re-authorized. State Rep. Shannon McMillan, R-Silverton, has proposed legislation to address a long-standing federal bogeyman: the EPA. What brought the EPA to the North Idaho valley is the cleanup of the Bunker Hill Superfund site, named after the shuttered mine that produced the most ore in the history of the mining district. Runoff of heavy metals from the mine has ended up running into Lake Coeur d’Alene and the Spokane River, causing elevated levels of lead in locals and wildlife. McMillan says the EPA’s work in the valley is done. “By their own admissions, the lead levels have gone down and are acceptable, so why do they need to stay there?” McMillan asks. The feds have not been making themselves many friends in the Silver Valley lately. The shutdown of the Lucky Friday mine by federal regulators last month shocked residents in the valley, many of whom depend on silver mining for their livelihood. In response, McMillan says she is considering legislation next year to place mine inspectors under local control rather than federal control. Federal inspectors, she says, are not sensitive to the dynamics of the local mining industry. 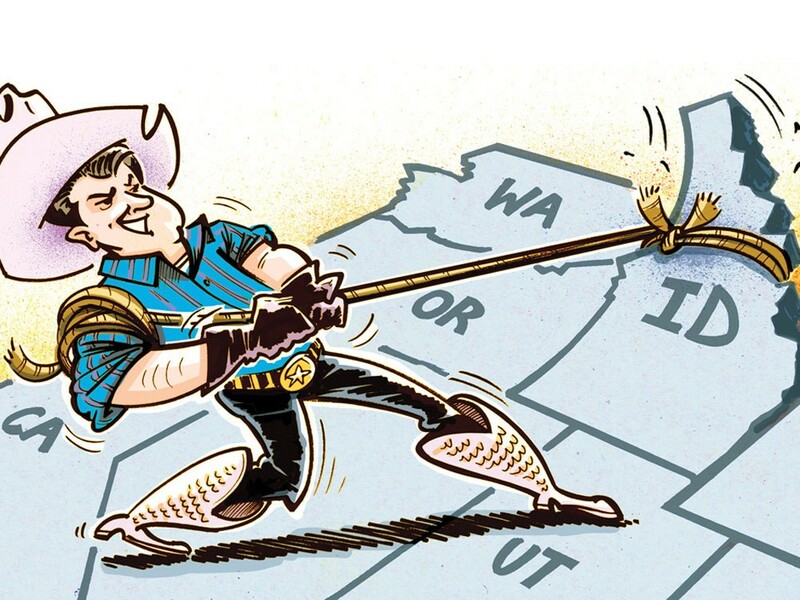 So, will Idaho be the next South Carolina, breaking away from the union as the first stone in a landslide of state independence? Will it join Washington, British Columbia and Oregon to form Cascadia, an old proposal to make the Pacific Northwest its own nation? Probably not. But Republicans say that they are tired of the feds coming in and messing with their affairs. Or, in the words of state Sen. Dan Schmidt, D-Moscow, they’re just trying to look good for the voters.